This past weekend Daisy and I were pleased to host my brother, Jonathan, his fiancee, Shannon, and their adorable three-year-old daughter, Natasha. Though keeping up with a three-year-old is pretty darn exhausting it was great having her around, especially as everything in the city is interesting to a three-year-old from upstate New York. Whether it was riding the subway, going to the park, or even just walking down the street Natasha was fascinated by everything…and I mean everything. The train tracks? She wanted an up-close look. The nasty gunk on the sidewalk? She wanted an up-close look. Anything that was moving, dangerous, or disgusting? She wanted, well, you get the idea. Those of you who are parents are probably used to such shenanigans but Daisy and I certainly are not. At Central Park though, well, what she wanted was an up-close look at the Mallards in the pond. And who was I to complain about that? I’m not sure if it was really the ducks she cared about or if it was the joy of throwing bits of bread to them but she had a grand ol’ time at the edge of the pond. Of course, once a three-year-old starts throwing bits of bread about other birds can’t help trying for a handout as well. Let me tell you, the House Sparrows, European Starlings, and Rock Pigeons were more than happy to have Natasha visiting the Big Apple! Natasha was especially excited by the pigeons, particularly when they waited until she was very close and then took off in furious wing-beats. Pigeons are not common in the area where she lives so, for all I know, this weekend might have been the first time she has ever seen one! And though they are familiar to her from when they rob her grandfather’s feeders she still liked the fact that the squirrels were unafraid and let her get nearly close enough to touch them (though we wouldn’t let her try). I, for one, was glad to see the common creatures in Central Park with a three-year-old, as it reminded me, yet again, that I shouldn’t take the “trash birds” for granted. 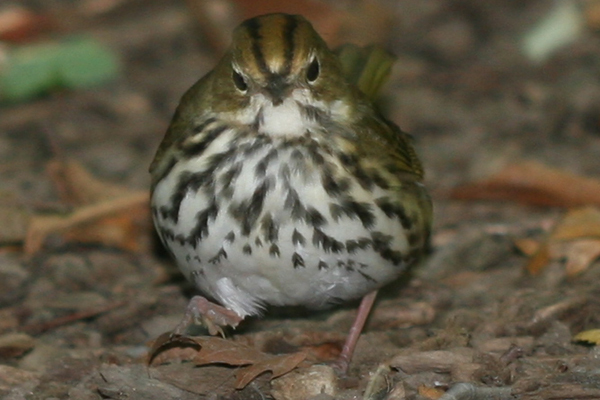 Though I will add, however, that I was pleased as punch when, on a rest break from chasing after Natasha, an Ovenbird emerged from under a bush right next to me and let me watch it forage for a bit before scurrying off into the bushes. I couldn’t agree more. I have a new perspective as a non-native. I often look at Blue Jays and I’m amazed at their color and interesting personalities. Maybe if I was born in the States I wouldn’t appreciate them as much…. I was in Central Park on sunday. I was walking through the park not expecting to see any birds of note because the Columbus Day parade was going on less than 100 yards away and the park was packed with people. As I was walking through the crowds on the mall an adult red-tailed hawk flew at head level through the crowd at top speed and tried to catch a pigeon. Only three or four people reacted. It all happened so quick I guess the crowd missed it. Non-native perspectives, indeed: I was showing a friend of my sister’s around the city a week or two ago, a life-long Parisienne of whom you’d think “OK, this woman has seen it all.” She was absolutely, completely, crazy-in-a-little-kid-way delighted by… the squirrels. wow that is an amazing story We decided to go to Bronx zoo when we can come up. I hope you can come to Mommy’s b-day Party LOVE YA!!!!!!!!! Having put a lot of time and energy into learning the finer points of bird ID and behaviour, I now sometimes find myself “regressing,” letting the minutiae take a back seat to a Greater Whole. Part of the mid-life crisis, I guess, but my goal now is to “B.L.N.,” or “be like Natasha.” Or like Tim’s Parisienne friend. Or Owlman and his Bluejays. Mallards, squirrels, Jays, these are pretty amazing and beautiful miracles, around us all the time. Of course, I’m sure the next RBA hottie will have me running out the door, bins in hand, but I guess I’m just realizing that there are different flavours of miracle. @Joseph: It’s is amazing how much most people miss. @Raven: You and your sister need to talk to your mom and and me and figure out when you guys are coming down! @OpposableChums: Exactly. Birds (and nature in general) are wonderful whether rare or common!